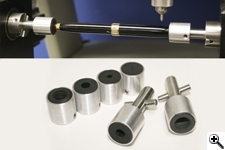 All Vision accessories are designed and crafted in our in-house machine shop. Here at Vision, we turn blocks of metal into necessary and helpful tools for your business. 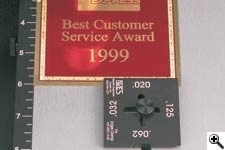 Our clamps, fixtures and vises are created to make your job easier by making your Vision engraving system even more efficient. Many of the fixtures are used in conjunction with our Versa Vise or Quick-Lock Vise that makes it easier to switch items. 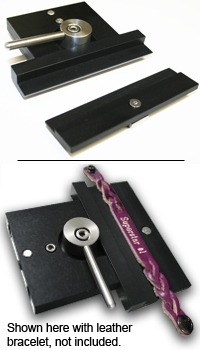 Multi Mat eliminates the need for double stick tape, clamps, vacuum tables, and most other hold down methods on many engravable items. 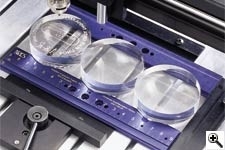 Multi Mat will hold most types of engraving stock, including brass, aluminum, plastic, and acrylic. 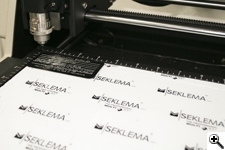 Just press it into place on any size engraving table and you’re ready to go, and because Multi Mat is produced with a special rubber coating on both sides, it cleans easily for extended use. 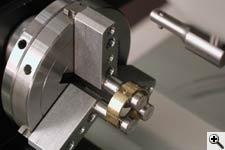 This clamp is designed to secure engraving materials from the top surface and avoids bowing in most applications. This clamp will hold material thicknesses of .020, .032, .062, and .125 by rotating the clamp and tightening a thumbscrew. Fits all Vision T-slot tables. 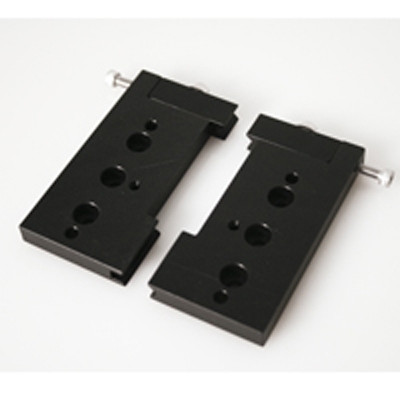 This clamp is designed to hold down square or rectangular plates. 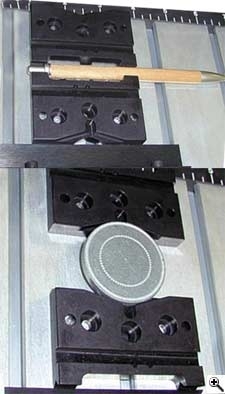 By lining up the “V” cut-out of the clamp with the corner of the plate, the engraver is allowed maximum engraving space. It will accommodate material as thin as 1/32”. Fits all Vision T-slot tables. This vise can be used with the VE-810XD and the VE-810 or the Phoenix 1212. 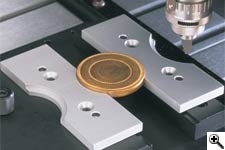 The self-centering design allows easy setup of odd-shaped items up to 3 1/4" deep. 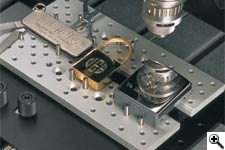 This fixture allows you to engrave around the inside and outside of most rings or other cylindrical objects. Min. Dia: 5/8" Max Dia: 4"
Available for the Versa Vise, Quick-Lock Vise, Vision T-slot table, and Self-Centering Vise. These fixtures enable engraving on all unique-sized pens, lighters, knives, key-chains, and many other irregular-shaped items. 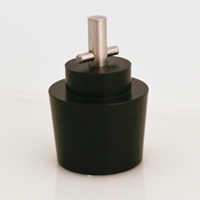 The Versa Vise can be used alone or in conjunction with other fixtures to hold a variety of shapes and sizes. 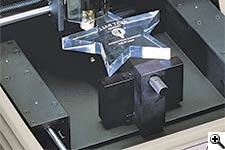 This fixture enables engraving on 1 5/8" & 2" diameter notary seals, medallions, coasters, paperweights, and other round objects. Can be used with the Quick-Lock or Versa Vise. Fits all Vision T-slot tables. This fixture allows you to engrave around the outside of most pens with the MAX & MAX PRO Engraver. This piece of engraving equipment enables engraving on most sizes of pens and cylindrical items that vary in diameter from end to end. Available for most computerized engravers. 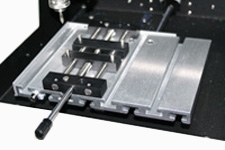 It is also usable with the Versa Vise and Self-Centering Vise. 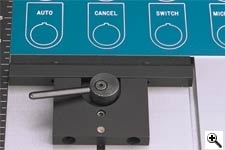 Fits all T-slot tables. 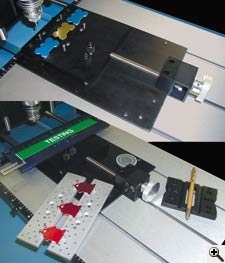 This piece of engraving equipment is specifically made for engraving leather bracelets and keychains. Designed to work with any Vision T-slot Table, it features a removable front clamping plate with a "cam" type locking device. For use with Max and Max Pro engraver only.